He married Amanda Rowe2,5,7,8 [Amanda Row8], Apr 8 18762,5,7,8 [Apr 18 18763], Randolph County, Indiana2,5,7,8 [Jericho MM3]. Amanda, daughter of Henry Rowe & Marie Van Sickle3,9,10, was born Mar - 18573,9,10 [Feb 10 18576], Perry County, Ohio3,9,10 [New Lexington, Perry County, Ohio6]. Davis, William, age 28, born in Ohio; parents born in Ohio; farmer. Davis, Manda, wife, age 23, born in Ohio; parents born in Ohio; keeping house. Davis, Anna, daughter, age 6, born in Indiana; parents born in Ohio. Davis, Arra D., "Da Son", age 2, born in Indiana; father born in Ohio; mother born in Indiana. 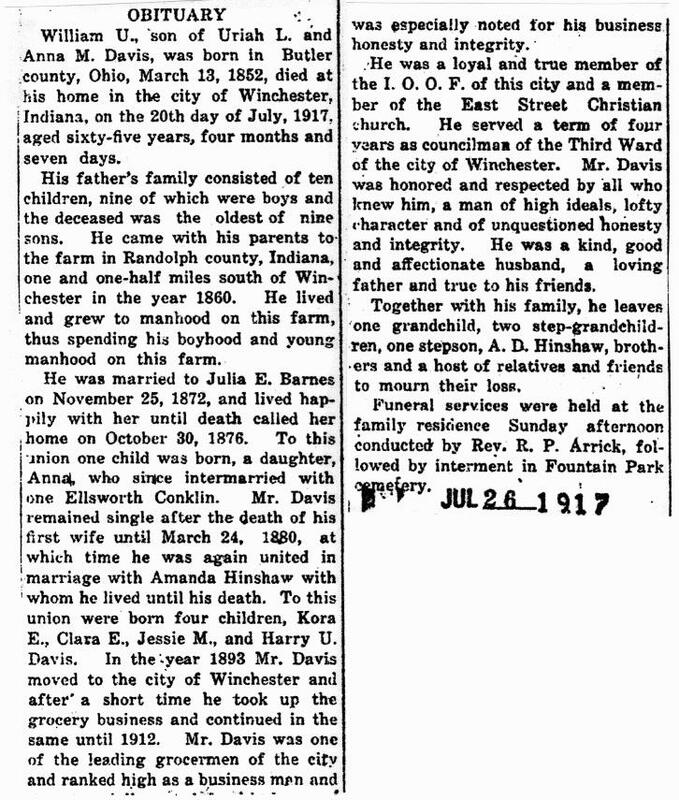 Davis, William U., head-of-household, age 48, born Mch 1852 in Ohio; parents born in Ohio; married 20 years; occupation: grocer; owned home (free). 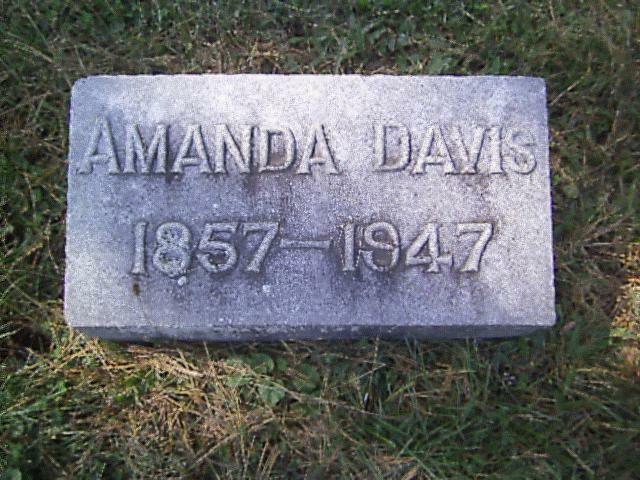 Davis, Amanda, wife, age 43, born Mch 1857 in Ohio; parents born in Ohio; married 20 years; 5 children, 5 living. Hinshaw, Arra D., step-son, age 23, born Apr 1877 in Indiana; father born in Indiana; mother born in Ohio; single; occupation: salesman, grocery. Davis, Clara, daughter, age 18, born Dec 1881 in Indiana; parents born in Ohio; attended school 9 months. Davis, Cora E., son, age 15, born Nov 1884 in Indiana; parents born in Ohio; attended school 9 months. Davis, Bessie, daughter, age 11, born Aug 1888 in Indiana; parents born in Ohio; attended school 9 months. Davis, Harry, son, age 8, born Dec 1891 in Indiana; parents born in Ohio; attended school 9 months. Davis, Anna E., step-daughter, age 25, born Nov 1874 in Indiana; parents born in Ohio; single. Davis, William U., head-of-household, age 58, born in Ohio; parents born in Ohio; second marriage, married 30 years; occupation: retail merchant, groceries; owned home (free). Davis, Manda, wife, age 53, born in Ohio; parents born in Ohio; second marriage, married 30 years; 5 children, 5 living. Davis, Clara E., daughter, age 26, born in Indiana; parents born in Ohio. Davis, Bessie M., daughter, age 21, born in Indiana; parents born in Ohio. Davis, Harry, son, age 18, born in Indiana; parents born in Ohio; occupation: salesman, groceries. Davis, Amanda, head-of-household, age 62, born in Ohio; father born in Maryland; mother born in Ohio; widow; owned home (free); occupation: none. Davis, Harry, son, age 27, born in Indiana; parents born in Ohio; single; occupation: chauffer, construction co.
Davis, Clara, daughter, age 36, born in Indiana; parents born in Ohio; single; occupation: saleswoman, dry goods. Davis, Bessie, daughter, age 29, born in Indiana; parents born in Ohio; single; occupation: none. Davis, Amanda, head-of-household, age 73, born in Ohio; father born in Maryland; mother born in Ohio; widow; owned home ($4000 value); radio in home; occupation: none. Davis, Clara, daughter, age 46, born in Indiana; parents born in Ohio; single; occupation: saleslady, dept. store. Davis, Bessie, daughter, age 38, born in Indiana; parents born in Ohio; single; occupation: servant, home. Mrs. Amanda Davis, 89, widow of W. U. Davis, and the mother of Winchester Chief-of-Police Cora Davis, died at 1:50 o'clock Sunday morning at her home in Winchester following a long illness. Funeral services will be held at the residence in Winchester at 3:15 o'clock Tuesday afternoon, Rev Aaron Napier officiating. Burial will be in the Fountain Park cemetery. The body has been removed to the residence from t he Summers funeral home. Mrs. Davis is survived by two other sons, A.D. Hinshaw and Harry Davis, both of Winchester; three daughters, Mrs. Anna Conklin of Union City, and Miss Clara and Miss Bessie Davis both at home; four grandchildren and seven great grandchildren; one sister, Mrs. Ella Davis, of Winchester, and three brothers, John Rowe of Winchester, Harvey Rowe of Muncie, and Frank Rowe of Richmond. Amanda Rowe Davis, 6th child of Henry and Maria Van Sickle Rowe was born Feb 10, 1857 near New Lexington, OH and departed from this life Apr 7, 1946, at her home in Winchester, 333 E. North St.
Before the age of 10, she came with her family to Randolph County, Indiana settling west of Harrisville, and obtaind her schooling at the Old Round Top School. 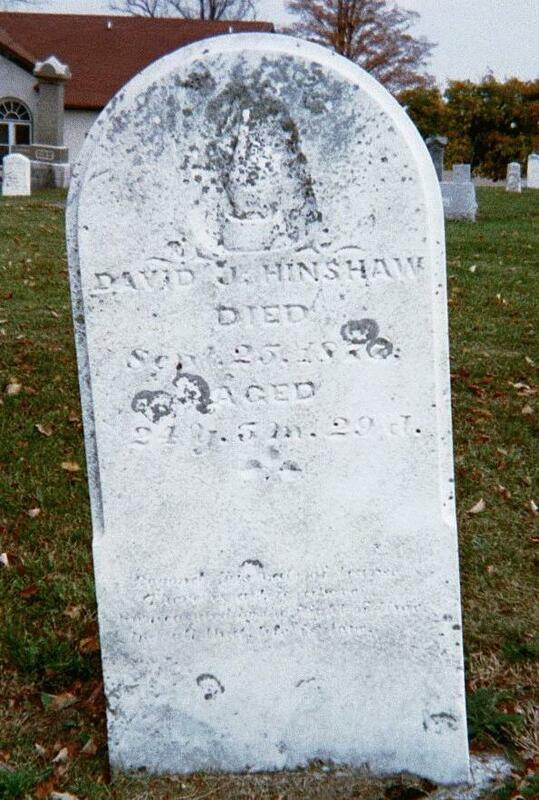 On April 8, 1876 She married David J. Hinshaw who passed away Sept 25, 1877. To this union was bornn [sic] 1 child Arra D. Hinshaw of this city. On Mar 24, 1880 she was united in marriage to William Uriah Davis. To this union was born 4 children, namely Clara E., Kora E. Bessie M, Harry U. all of this city. She is also survived by a step daughter, Mrs. Anna Davis Conklin of nenar [sic] Union City. 4 grand ch. 6 great grandch. 4 brothers: Frank Rowe of Richmond, Harve Rowe of Muncie, John Rowe and a sister mrs. Ella Davis of this city. Mrs. Davis was a member of the Winchester Friends Church and the Messenger Society. Contribution from Melissa Hinshaw Owens citing: . RootsWeb WorldConnect data from Thomas C (Mike) Haydock (). 1900 census, Winchester, White River Township, Randolph County, Indiana; roll T623-399, ED 137, page 20A, line #6, dwelling #457, family #472. 1910 census, Winchester, White River Township, Randolph County, Indiana; roll T624-376, ED 152, page 10A, line #31, dwelling #226, family #235. 1880 census, White River Township, Randolph County, Indiana; roll T9-307, ED 165, page 105D, line #9, dwelling #172, family #180. 1920 census, 3rd Ward, Winchester, White River Township, Randolph County, Indiana; roll T625-464, ED 173, page 6A, line #32, dwelling #142, family #144. 1930 census, 3rd Ward, Winchester, White River Township, Randolph County, Indiana; roll T626-624, ED 26, page 11A, line #33, dwelling #252, family #268. Obituary of Amanda (Rowe) Davis; Randolph County Historical Museum.